The contemporary Panama Canal expansion includes a third set of locks that will accommodate longer and deeper draft vessels. The new locks will also almost double the shipping capacity of the Canal. The impacts of the expansion will be felt around the world. Ports, such as PortMiami and Port Tampa Bay, are simultaneously expanding to cater to the post-panamax vessels that will traverse the new Canal locks. View live footage from the Panama Canal Expansion via webcams provided by the Panama Canal Authority. 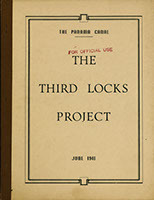 The Third Locks Project. 1941. TC774.C428 1941 Latin American & Caribbean Collection, George A. Smathers Libraries. Gift of the Panama Canal Museum. 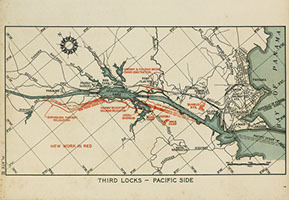 In 1939 U.S. Congress authorized building a third set of locks in the Panama Canal. Plans called for locks 1,200 feet long and 135 feet wide with a navigable depth of 45 feet. War in Europe made the expansion necessary for military as well as commercial purposes. After the Japanese attack on Pearl Harbor, the focus shifted from battleships to aircraft carriers. Construction on the third locks was abandoned in May 1942. Third Locks - Atlantic Side from The Third Locks Project. 1941. TC774.C428 1941 Latin American & Caribbean Collection, George A. Smathers Libraries. Gift of the Panama Canal Museum. 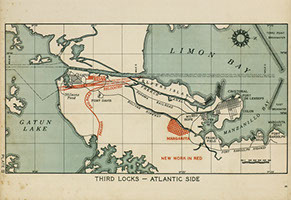 The original excavations for the third set of locks on the Atlantic side are expediting construction of the modern locks. The new, enlarged water chambers are being built on the original excavation site. Third Locks - Pacific Side from The Third Locks Project. 1941. TC774.C428 1941 Latin American & Caribbean Collection, George A. Smathers Libraries. Gift of the Panama Canal Museum. The chambers of the earlier third locks on the Pacific side had to be relocated and the original excavation filled in. 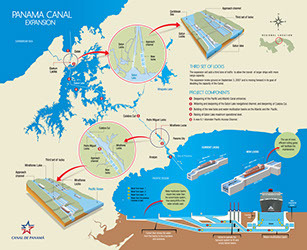 The Panama Canal expansion includes a new set of locks with three chambers, water-saving basins, a lateral filling and emptying system, and rolling gates.